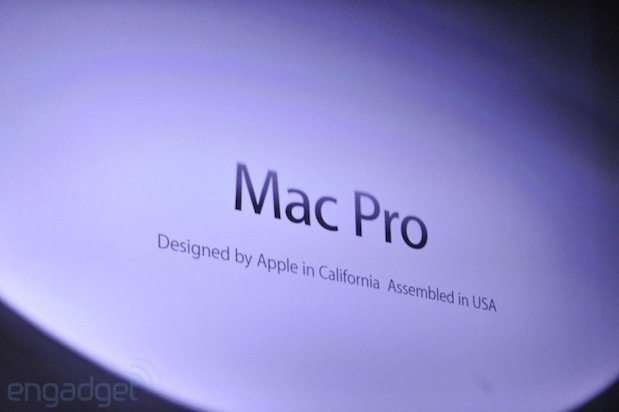 Apple To Assemble Mac Pro In The U.S. The U.S. manufacturing industry isn’t a lost cause after all: Apple has made good on its promise to make the new line of Mac Pros in America. There were very few details announced during the keynote at Apple’s WWDC today, but we’re guessing they’ll be assembled in Apple’s new Texas plant. The slope of decline in U.S manufacturing has gone from bunny slope in the 1960s to double-black diamond in the 90s and 2000s. Manufacturing was 29 percent of jobs in the 1960s, but fell to just 9 percent in 2011. Recently, we’ve seen an uptick of a half-million jobs from 2010-2012, which marks a positive new trend — however mild — in the beleagured sector. And Apple wants to take all the credit it can. CEO Tim Cook has been teasing a return to the homeland during a PR blitz. For instance, at last month’s Congressional grilling over Apple’s $13 billion in tax dodging, Cook reminded the fawning politicians how many valuable jobs the company provides in the U.S.
Apple isn’t the first computer giant to bring manufacturing back to the good ol’ U. S. of A. IBM made plans to bring the manufacturing of its popular Lenovo series stateside. “The Chinese computer company intends to start manufacturing a small quantity of ThinkPad and ThinkCentre laptops, desktops and tablets in North Carolina. The Whitsett, N.C., facility will employ just over 100 workers and cost the successful company a mere few million,” explains our own Matt Burns. More details on Apple’s plans to come soon. Correction: the original title said “Manufacture” in the U.S. We only know for certain that Apple will assemble it in the U.S.